AMD will continue to be a “high-risk/high-reward” stock with a lot of volatility, RBC says. The chipmaker had been rallying in recent weeks as rival Intel struggled to produce a 10-nanometre chip. On Wednesday, one day after a report said Intel’s chip production could ramp up soon than expected, AMD shares tumbled into a bear market before receiving an upgrade at the ratings agency Moody’s. AMD will continue to be a high risk, high reward stock with a lot of volatility, RBC says. 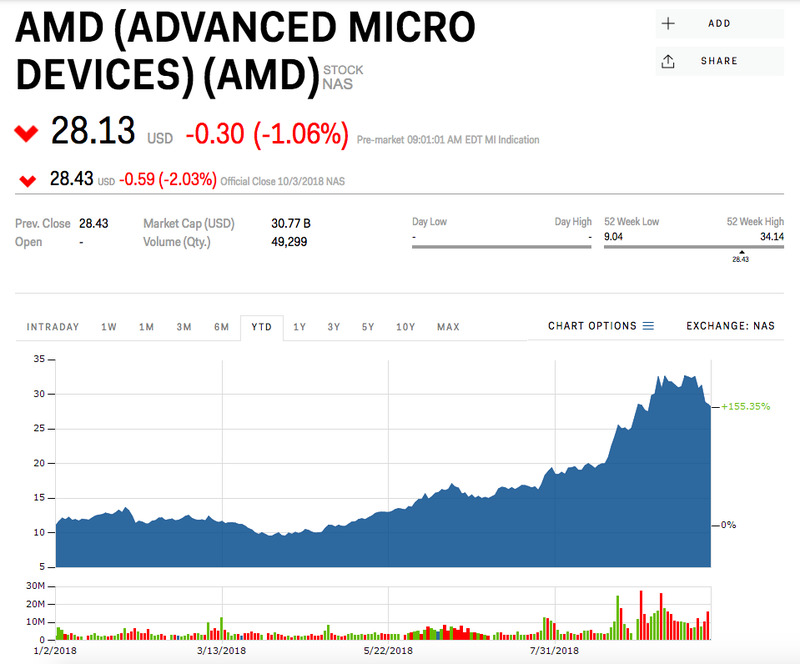 “AMD remains as our high-risk/high-reward name where we believe upside could be $US60 and downside to around $US15 if the product has issues,” RBC analyst Mitch Steves said in a note sent to clients on Wednesday. 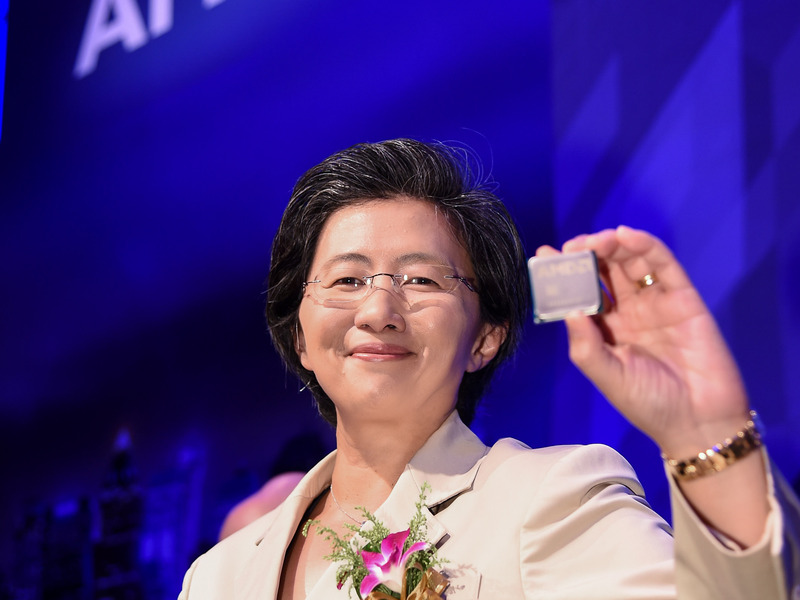 AMD had been rallying in recent weeks after analysts projected Intel’s struggle to produce a 10-nanometre chip would likely benefit it in the server and high-end commercial-desktop market. Intel will undersupply the PC market with chips between the last quarter of 2018 and the second half of 2019 by 15%, Jefferies said. But on Tuesday, AMD dropped nearly 4% after a research report said rival Intel may cure its production problem sooner than expected. Tuesday’s sell-off spilled over into Wednesday, with AMD shares falling another 8% before bouncing after the ratings agency Moody’s upgraded the name, citing growth in its PC segment as well as strength in gaming consoles like the Xbox and the PlayStation. AMD’s stock was down 22% from its September high at Wednesday’s low. Moody’s also mentioned that, while Intel has struggled to produce a 10-nanometre chip, AMD has sped up sampling 7-nanometre server processors, which in theory provide better performance than 10nm ones. AMD is expected to launch a 7nm datacenter GPU later in 2018, which can help the company increase its share of the profitable and growing server CPU market from its current level of just over 1%, said Moody’s. “We don’t expect much heading into the end of the year as we believe Intel will maintain its PC share by shipping 14nm chips into the low-end PC market,” Steves said. “We maintain our recommendation that investors should accumulate the stock on its weakness and continue to do channel checks on PC and Server demand for the 7nm chip in the first quarter of 2019,” he added. AMD shares were up 155% this year through Wednesday.